So here it is as as announced earlier in the week. 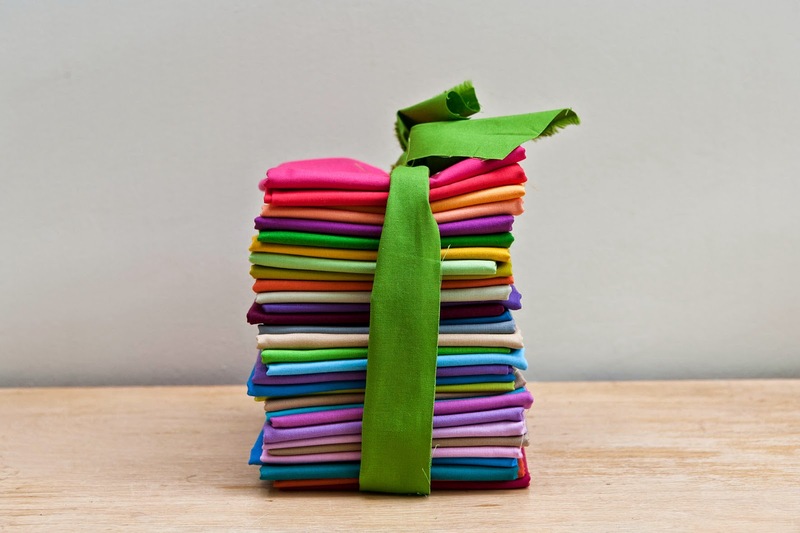 Robert Kaufman and I are giving away one fat quarter set of the 33 new Kona Cotton colours to one lucky winner. To participate in the giveaway you simply need to tell me if you have ever made a solids only quilt and/or will consider it in the future. Enjoy and thank you very much for participating ! I've made several of various sides so far. Working on more, it is kinda joyous to work with all solids - I like not having to think TOO hard and I find I find working with prints can be more work and second guessing. I really like working with solids and took part in the Simply Solids bee last year - my Fallow group bee mates made some wonderful X and + blocks in solids and I love how the quilt turned out! I have never made a quilt with all solids but I would love to. I'm very inspired by Charlotte at DisplacementActivity and by Alissa Haight Carlton and I absolutely love your Comet and Dreams of Summer quilts, so I think a couple of solids only quilts are in my near future. I've only made 2 solids quilts. Loved the effect of the super intense colours together and the blocks forming the major pattern. The solids felt freer to work with too. I haven't made a quilt with only solids yet, but desperately want to. I'd love to win this bundle. I use Kona solids all the time in my quilts as I love the colours in the extensive range which set off patterned fabrics very well. I have not made a solids only quilt although it is certainly a thought for a future quilt. The Giveaway would be marvellous to win! My bee buddies are making me solids blocks at the moment! I am really loving the look of it! And one day I would like to make a triangle quilt out of solids! It's definitely on my 'to-do' list! Thanks for the giveaway- these are brilliant fabrics! I love making solid only quilts and so far they have all been made from kona as well. No I haven't done a quilt with just solids... But I am collecting solids.... Still In that phase...lol...and these new colours would be such a happy add to my stash... Oh think of what one can do with them...they are gorgeous!! Yes, I made the cover quilt from the book 'We Love Color' and will certainly make another one or more! Have made several small quilts with mainly solids, with a couple of prints scattered through - most recently one of Elizabeth Hartman's - but would definitely try all solids if the right pattern grabs me. Thanks. I've never made a solids-only quilt but would give it a go if I won that lovely bundle! I've just finished Cluck Cluck Sew's Suburbs pattern in solids. It turned out great. Thanks for the giveaway. What a generous giveaway! I've not yet made a solids only quilt but I've had an idea for a modern solid colours quilt top that's been percolating for a while; this bundle would be perfect to try it out. when I first started quilting solids is all I used, and will be doing another soon.. Love these newer solids! I've never made an all solids quilt but I'd love to start with the 'Canvas' pattern! I have, it was a baby quilt made with a bunch of vintage solid HST's and Kona bone. I would definitely make another solids quilt! I've made a quilt top that was entirely solid, but used a print on the back! I suppose that doesn't count! I would totally make an all solids in the future though. I've got one drawn up already! Yes, I'm happy to say that I have made one solids only quilt and I love it (I've made a few pillows in only solids, too, again they are favourites). I actually have another solids quilt idea all sketched up and waiting. Just working out the colours and trying to decide how big I will make it. I love Kona solids and the new colours are mouth watering gorgeous. Thanks for the chance to win some! I love the new Kona colors! I've made several solids-only quilts. My favorite was made with the Kona Cottons Poseidon FQ bundle -- it looks like a mass of sea glass! The first large quilt I finished was all solids. I do wish that I had used a fun print on the back. I would definitely make an all solids quilt top again! I love solids, but somehow have only managed to make a single mini quilt that was all solids. I do have two pillow cases in the plans though. I have never made a quilt with only solids but after seeing all the beautiful ones out there, I am going to have to give it a shot! Yes, I have made a couple solids only baby quilts. Both of them were in scarlet and grey and white (Ohio State colors). Go Bucks! Of course I would make a solids only quilt. Thanks for the chance to win a good start on it. out of my hand dyed fabric. I love them. This is a great give away. I've never made one "all solids" yet, but it remains in the "to do" list, for a near future. I have made an all solid quilt and would like to make more. I've made several all solids quilts (including one of my cat's face!) and plan to make several more. These would help! I am actually right now making a solids only quilt (with Kona :)) and I definitely love the impact it has! Would be the happiest person if I would win - love the colors! I want very much to make a quilt with all solids. I just made a beautiful fat quarter pack like this one! I have a pattern called "chop & sew" a "from the nest" design. It calls for 12 fqs and I have 9 colors set aside (all darks) but have not decided on the last 3. That will be my first solid only quilt. I love adding solids to prints - I have made three quilts with pezzy prints and solids - love them all. These new colors are amazing! I have made and finished one solids quilt, with blocks of appliqued elephants and piano keys borders. I have made a bright solids log cabin quilt top and hope to finish it soon. Both are wall quilts, and solids seem to be SO appropriate for wall quilts! I've got everything ready for my next quilt. It is Kona Cotton used in an appliqué quilt. My first all solids quilt. I wonder if any of the new colors would replace the ones I have already picked out. I don't think I've ever made a just solids quilt, but I certainly will do one day! Great giveaway! Thanks. I have not made a solids quilt yet but after seeing your Sketch quilt in the flesh I did buy a bunch of Kona solids and neutrals with a similar design quilt in mind. Love the new Kona colours - what a fab giveaway! I love to use just solids and have done so many occasions. I find them more timeless than prints. I'd love to have this bundle in my stash. erincode-at-metzlers-dot-org. I love solids and have made quite a few quilts using just solids. I have not but I DEFINITELY am planning to. I haven't made a whole solid quilt, but I have a Neon half yard pack. I want to use a solid grey to make a quilt someday :-). Thanks for this great giveaway! My problem is that I'm so attracted to the prints that I forget that solids are absolutely necessary in quilting! LOL No, I've never made an all solid quilt, but I'd consider it to do something that's out of my box. Thank you for hosting this giveaway! I have not made a pure solids quilt yet, but hoping to make the Rebel Quilt be Libs Elliott during the autumn. I have never made a solids only quilt. I do like using solids to help calm down my scrappy quilts. Thanks for the chance to win. I love working with solids and have a number of quilts which are "solid only" - they seem to be very clean, crisp and striking - Love them. Yes I have made a solid only quilt. I like solids the best. Thanks for the chance to win. I've also listed your giveaway on my Giveaway Round up at wowilikethat.com. Thanks again. Gorgeous stack! Nope, I haven't made a quilt from purely solids but it's definitely on my list! Yes I've made one mini (the one we had in the LMQG gallery at Festival of Quilts) I can't wait to make a bigger one of solids. I have never made an all solids quilt, but I would love to!! Thanks for the chance to win! I haven't yet, but I'd love to! I've seen some gorgeous ones lately, so it's really making me wish I had a bigger solids stash. I haven't made a solid quilt yet, but if love to try! Wow, these are gorgeous. I have never made a solids only quilt, but would love to, yes. I've never made a solids only quilt - but then, I've only ever made 5-6 quilts altogether! These colors are gorgeous!!! I have made a solid quilt as part of a mystery quilt day! I absolutely love it and gifted it to my honey! He loves it! I would love the chance to make another one! I think they make such an impact! Thanks for the chance to enter your giveaway! It is very generous! I have never made a solids only quilt but I would consider it. I've never made a quilt with only solids but I love a pop of color. I haven't made a solids only quilt, but I would love to make one. I've never made a solids only quilt but I have been planning on it. I'm picturing a combination of Kona and Oakshott! I almost said not yet, but just remembered that I actually made two with lovely Kona bundles full of blues and greens. And I'd certainly like to make some more, maybe more colourful this time. Oh, lovely giveaway! Yes, I have made more than one solids only quilt, and have several on my mental "must make" list. Such a gorgeous bundle. I've never made a quilt with just solids, however I'd love to one day! I've never made a solids-only quilt before, but I'd love to give it a try some time. 33 solids gives so many unique possibilities for my quilting...it would be my first solids quilt. I'm so excited to try that! you are so generous to share, thank you so much. I absolutely love solids only quilts, but have only made one. It was really fun & I like how it feels really clean & crisp. No distractions, just the colours! I have never made a solids only quilt but a nearly all solids quilt with a few sentimental prints thrown in per the commission request. Am planning one now though! I haven't made an all solids quilt yet, but have so many on my wish list. I've been waiting to build up my solid stash before I start one! I have made a quilt or two in all solids…and loved them! I haven't so far, but I'm about to try one. I love how they look. I had so much fun watching the daily release of the new colours, and really loved them all! I have made 2 solids quilts, and I am working on my third right now. There is just something so special about solids! Thanks for the chance! Never made a solids only quilt and the only thing stopping me is the lack of solids in my stash. I have made solid colored quilts. My daughter requests those all the time. Thanks for the generous giveaway. I have not made a solids only quilt. There are a couple of patterns I do like that would work beautifully for a solids only quilt. I have not gotten too it yet. I love your Folks and Friends quilt! I have never made an all solids quilt, but I love combining solids and prints. That's what I would do with this beautiful bundle. So I'd probably never made an all solids quilt. I wouldn't be able to resist throwing in a print or two. Thanks for the chance to win! I"ve never made a quilt with solids, but I am seriously considering doing one with solids for my sister's christmas present. I have made a few solids only quilts, my favourite is a plus quilt that I made for my daughter & her partner. I'm planning a new HST quilt with Kona solids. Thanks for the great giveaway. Yes, I made a pinwheel quilt. It turned out so well. Love the new colors. Thank you for the giveaway! Lovely giveaway!! Never made a solids quilt but would love to use these on something like the Moda modern quilting blocks quilt!! I'm making one right now! I was hoping to have all the kona colours in it but these new ones came out just after I cut all my fabric. I have one small wall hanging I'm working on in solids. I need to I love solids, just always tried to clean out my stash before buying much fabric. Thanks for the chance. I would love to try a solids-only quilt. Maybe it will be my next one if I am lucky in this giveaway! Yes! In fact I was at a great wokshop yesterday where I am making another solids only quilt. I came to solids only a few years ago but love them now. I must have made 3 or 4 so far, but after this workshop, now I will make more! Thanks so much for the chance to win! I have not made anything out of only solids! But I think my husband would like me to make a solid only quilt so this would be a great opportunity! I started on a solids quilt last year with the Kona Grecian Waters bundle. Need to finish that sometime but I'd also love to make another solids quilt in the future. Thanks for the chance. I have made and continue to make loads of quilts with only solids. I also love using Essex linen solids in quilts. I am excited to see your new patterns. I''ve never made a solids only quilt, but, I am open to it. I was going to enter our solids challenge with my guild, last winter, but, I couldn't find my packet until after the due date. I haven't made a solids quilt yet, but I will. Made a solids cushion, which is a favourite of mine though! I love reading your blog and have been impressed by the work done with solids. Like many quilters, I am tiring of prints at the moment. So many contemporary improvised quilts are appearing in blogs and I am very keen to have a go. Your giveaway would be an amazing starting point, as I have not made a solids-only quilt in the past.